You might be surprised to learn how much your dental health says about your physical well-being. Periodontal disease is a precursor for some pretty serious medical conditions, including heart disease, diabetes, and stroke. The healthier our mouths are, the healthier our bodies will be. And fortunately, it’s not that hard to care for them! Dry Mouth. Dry mouth is a condition where the mouth stops making necessary amounts of saliva. It’s a common side effect of many medications, cancer treatments, and dehydration. More than being a nuisance, decreased saliva production puts seniors at a higher risk for developing gingivitis, tooth decay, and mouth infections such as thrush. The dentist may recommend specialized mouthwashes or the implementation of a humidifier to help keep the mouth moist. Root Decay. Typically, gums begin to recede with age, and as a result of gum disease. This will eventually leave the higher parts of the tooth, which are the lower portions of the roots, exposed and vulnerable to acids and other substances that lead to their decay. If dental roots are damaged beyond repair, it leads to dental extractions. Gum Disease. Also called periodontal disease or gingivitis, gum disease is most commonly caused by an accumulation of plaque on the teeth and along the gum lines. This hard substance allows bacteria to grow, causing inflammation (gingivitis) that leads to gum disease – the leading cause of tooth loss. Other common causes include smoking, use of dentures, poor diet, and certain diseases. Tooth Loss. As mentioned above, gum disease is the leading cause of tooth loss. Losing your natural teeth is a serious business. While dentures may seem synonymous with old age, they are also synonymous with poor diet and a deterioration of the gum tissue and jawbone. Dentures are typically uncomfortable and make it difficult for seniors to eat well, which leads to malnourishment, a compromised immune system, and susceptibility to other medical conditions. The longer you can keep your own healthy teeth, the better! Uneven jawbone. Your teeth, gums, and jaw have a very close relationship. When the teeth go missing or are extracted, the gums and jawbone begin to diminish, which can lead to misshapen jaws. If you break or lose a tooth, get to the dentist immediately to determine the best solution. Implants or well-fitting bridges and dentures will help to slow down receding gums and jaws. Denture-induced stomatitis. Dentures must be cleaned, maintained, and fitted on a regular basis or they can contribute to disease of the mouth. Denture-induced stomatitis can occur with poorly fitting dentures, poor oral hygiene, or an accumulation of a fungus called Candida albicans, which causes the gums to become inflamed and potentially infected. Thrush. This is the same condition that can affect babies and young children. It is a symptom of a compromised immune system and is the result of a build-up of the aforementioned fungus. Seniors in general are the most likely to stop seeing the dentist, especially in cases where dental insurance is no longer covered by a retirement health plan. 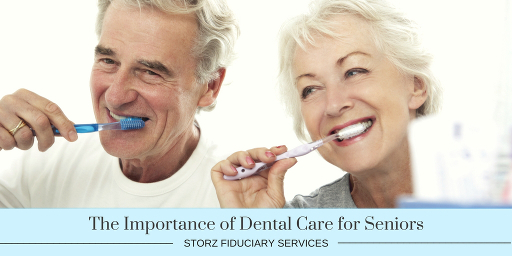 The good news is that most dentists offer special rates for seniors and those who do not have dental insurance. They are often willing to work with you on payment plans. Seniors can also apply for CareCredit, which can be used like a credit card for dental and other health services. Schedule your next dental checkup today, because dental care for seniors is crucial to overall health! 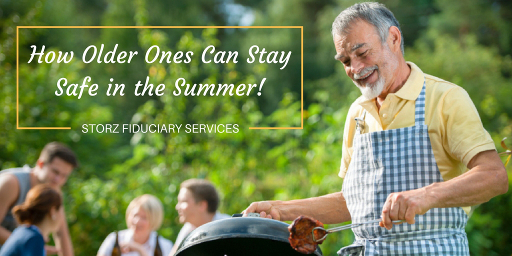 How Older Ones Can Stay Safe in the Summer! The summer is now here in full force and in most areas of the country there are times that it gets dangerously hot. The fact is, older ones are more susceptible to its ill effects. As you get older, your sweat glands are less active, and make it harder for your body to eliminate heat. Even seniors as young as their 60s still have a higher risk in the heat, especially if they have any chronic health conditions. 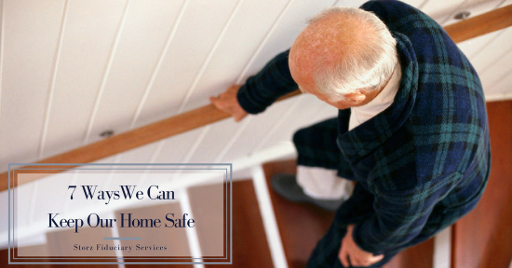 There are 4 basic, vital steps that everyone should take to protect themselves. Be sure to talk to your doctor about your concerns as well, and see what advice they have for you. 1. Sun Protection: First and foremost, you need to protect yourself before you even step outside. And that means more than applying sunscreen! You should absolutely wear it, though, any time you go out. Even when in the shade, or when it doesn’t seem too sunny, you should still apply it. You’d be surprised how much exposure you get even at those times! The Skin Cancer Foundation recommends using “broad-spectrum, water-resistant sunscreen with an SPF of 30 or higher”. This level of SPF filters out about 97 perfect on the sun’s UV radiation. Broad-spectrum ensures that you’re protected from both UVA and UVB rays. But it doesn’t stop there. Sunscreen can only do so much. You need to protect yourself additionally by wearing broad-rimmed hats and sunglasses. Choose loose-fitting clothing made from a breathable fabric such as cotton, and choose lighter colors. Avoid prolonged exposure from 10 a.m. to 4 p.m., the hottest part of the day. 2. Keep Hydrated: Most adults need about two quarts (64 ounces) of fluids every day, but that amount increases with heat and humidity and can change based on various medications. Drink plenty of cool water throughout the day, and avoid alcohol and caffeine, which will actually dehydrate you. If you struggle to drink enough water, remember that you can get extra hydration by eating water-rich foods such as cucumbers and watermelon. You can also purchase flavored waters, drink a half-and-half mixture of fruit juice and water, and include plenty of ice in your usual favorite beverage. But in the end, these need to be an accompaniment to a consistent intake of water throughout your day. 3. Cool Down: What steps can you take to stay cool throughout the day? If you feel very hot and uncomfortable, try a cool shower, or sit with your feet in a basin of cold water. Keep your AC at a reasonable temperature. If you’re out and about, be sure to have air-conditioned places around you – this includes coffee shops, libraries, stores, and the like. This is a great way to get mild exercise, too. Some seniors enjoy walking around malls in the early morning, especially if they have a friend to join them. 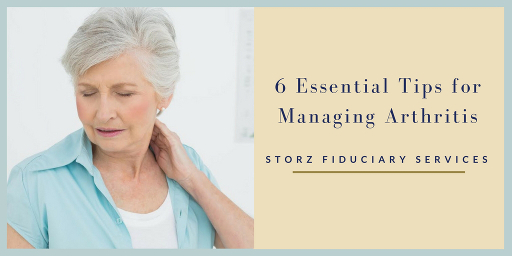 If you experience any of these symptoms, seek immediate help. 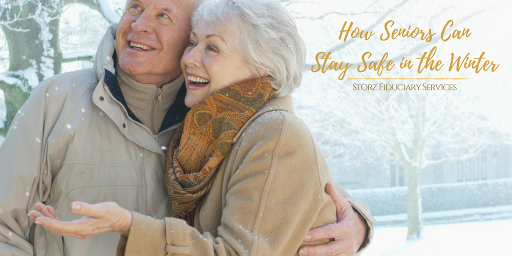 Call 911 and if you have any family or friends nearby, alert them to your situation, so they can stay with you until professional help arrives. In the meantime, some quick steps you can take include getting indoors or into the shade, removing excess or heavy clothing, and using a hand-held fan with a water mister. By following these guidelines, you can be sure to have a healthy, enjoyable summer! 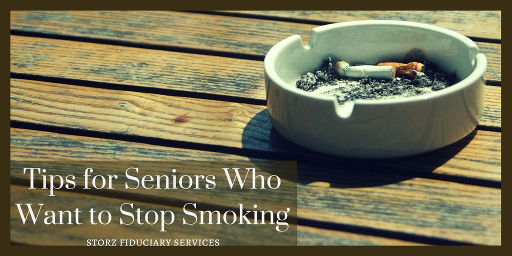 Are you a senior who smokes? You’re not alone. People of all ages struggle to quit, and know that there are risks to continuing to do it. However, older smokers are at greater risks because they have usually smoked longer (an average of 40 years), tend to be heavier smokers, and are more likely to suffer from smoking-related illnesses. It can become an ingrained part of their life that they can’t imagine giving up. You are most likely well aware of the increase in lung cancer due to smoking. What you may not know is smoking also dramatically increases the users risk of numerous other illnesses such as coronary heart disease, stroke and lower respiratory tract infections – all leading causes of death in those over 50 years of age. What would be the benefits go quitting? Here are just a few. Be sure to consult your doctor before embarking on major health changes. But how can you quit? You might be overwhelmed by the thought. Here are a few suggestions. See if a few of them appeal to you. Pick a date on the calendar to stop smoking, and share your goal with family/friends for moral support. List your personal reasons for quitting, and keep that list in view. Keep busy doing things that make it hard to smoke, like working in the yard and exercising. Fight the urge by going places where smoking isn’t allowed, and by staying around people who don’t smoke. Avoid situations that tempt you to smoke, like drinking coffee or alcohol. Find a substitute to reach for instead of a cigarette. Try a sugar-free hard candy or chew sugar-free gum. Remind yourself that you’re likely to feel better if you stop smoking. Ask your health care provider about using nicotine gum or patches. Some people find these aids helpful. Join a smoking cessation support group or program. Don’t throw in the towel if you smoke a cigarette. It doesn’t mean you failed! Seventy-five percent of people who quit subsequently relapse. Most smokers quit three times before they are successful! There’s no one way to quit that works for everyone. You must be ready emotionally and mentally. You must also want to quit smoking for yourself, and not to please your friends or family. Plan ahead. How can you keep yourself encouraged on the road to quitting? Don’t carry a lighter, matches or cigarettes with you. Ask other smokers to not smoke in your presence. Don’t focus on what you are missing. Think about the healthier way of life you are gaining. Keep yourself busy with healthy activities such as walking, seeing friends for lunch, and gardening. Don’t substitute food or sugar-based products for cigarettes. Eat low-calorie, healthy foods (such as carrot or celery sticks, sugar-free hard candies) or chew gum when the urge to smoke strikes so you can avoid weight gain. It is best to drink plenty of fluids, but to limit alcoholic and caffeinated beverages. They can trigger urges to smoke. Reward yourself for these milestones. You deserve it! Quitting becomes easier after the first few days. Withdrawal symptoms, such as feeling irritable, hungry, coughing often, getting headaches or having difficulty concentrating occur because the body is used to nicotine, the active addicting agent within cigarettes. These symptoms occur because the body is adjusting to the lack of nicotine. The withdrawal symptoms are only temporary. They are strongest when one is first quitting but will go away within 10 to 14 days. It is good to remember that withdrawal symptoms are easier to treat than the major diseases that smoking can cause. Don’t be discouraged if you have a relapse. Keep trying! Before embarking on any sort of health, exercise, or lifestyle changes, it’s important you speak to your doctor. Talk to your doctor about your desire to quit smoking beforehand, so that they can guide you. It’s important for people of all ages to get regular physical activity. Countless studies have shown its positive effects on physical, mental, and emotional health. 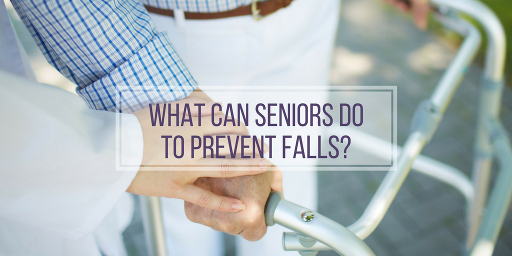 However, as you age, you might face concerns about injury. You might also wonder what sorts of activities are feasible for you. But staying fit doesn’t need to mean hours at the gym lifting weights! The important thing is to be moving around as much as possible, and to reduce the time you’re sitting. A study in 2012 found that those who sat for more than 8 hours a day increase their chances of developing type 2 diabetes by almost 90%! At the same time, a study published in the American Journal of Preventative Medicine showed that those who simply fidgeted while sitting reduced their risk of all-cause mortality. Clearly, it takes less effort than you’d think to stay healthy. The key is to put the effort in and find what works for you! Remember to ask your doctor before embarking on any fitness regime. Here are four ways that you can stay active! 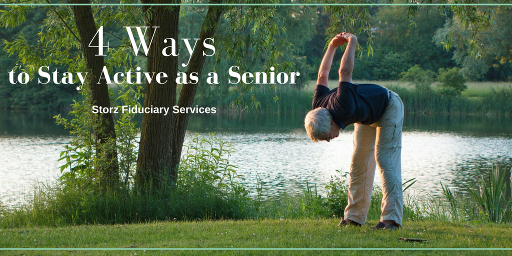 A fun and simple way to stay active is by pursuing specific hobbies. You’ll want to choose ones that get you moving – even if it’s just in your backyard! Gardening is a great choice that many seniors like. Moving from kneeling, sitting, and standing is important for your bones and muscles to keep their strength. Working with your hands promotes brain and physical coordination. The best part is, you can make it as comfortable as you like, and go at your own pace. You can buy a kneeling pad to ease some pressure off your knees. You can take a rest as often as you like. Even 5 minutes is great for you! The fresh air will do wonders for your mood as well. Other options include knitting, needlework, painting, and scrapbooking. When you think of fitness, these might not come to mind. But the fact is that you’re moving your body, no matter how small the movements are, while engaging the brain. Open your mind to the possibilities! Yoga, Pilates, Tai chi, and swimming are popular among seniors. They carry little risk of serious injury, and are easy to do in groups, with friends, or at home alone. 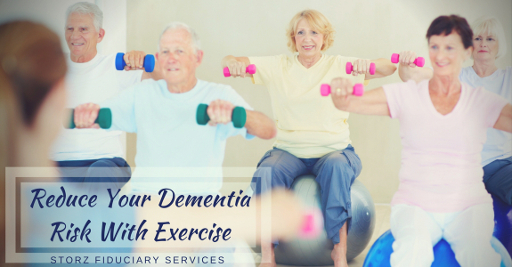 They’re an excellent option for those who are new to exercise or have concerns about safety. Yoga includes breath control, simple meditation, and the adoption of specific bodily postures, and is widely practiced for health and relaxation. Pilates is designed to improve physical strength, flexibility, and posture. It also enhances mental awareness. Tai chi is actually a martial art, however it focuses on alleviating stress and anxiety through slow and carefully controlled movements. Tai chi is often practiced in an outdoor setting, and can be quite invigorating! Swimming is a low-impact exercise, with little risk of injury. It’s gentle on your joints while improving muscle tone. Choose a friend or family member to be your buddy and go on walks or other activities with you. It could be your neighbor, your best friend, or even your spouse. You hold each other accountable, and it’s easier to stay committed that way. They’ll provide you with companionship and encouragement. In turn, you’ll do the same for them. Perhaps you can arrange to go on monthly hikes. If possible, it’s highly beneficial to find someone to walk with on a daily basis. Your buddy can even join you in your active hobbies, as discussed above. You can garden or knit together, for example, while enjoying each other’s company. You don’t need to do it alone! Group classes are like the buddy system, except on a larger scale! They bring a lot of fun and excitement to what might otherwise be considered tedious. 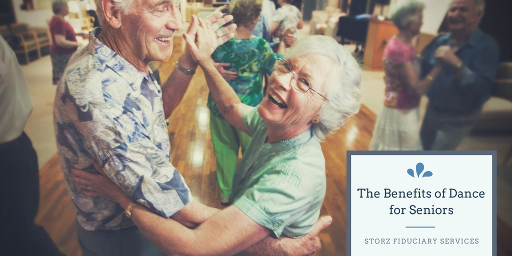 You might be surprised at how many there are specifically for seniors! Whatever you choose, the point is to be proactive about your fitness level. Only you and your doctor can decide what type is right for you. However, at any stage in your life there are things you can do to stay healthy and active!